Liz Etnier and her husband, David, graduated from the University of Minnesota with undergraduate degrees in Fish and Wildlife Management, and advanced degrees in Zoology. They moved to Knoxville, Tennessee in 1965, where he began teaching ichthyology at the University of Tennessee, and she began raising their family. After their three children started school, Liz began working part-time at Oak Ridge National Laboratory (ORNL) where she worked for 27 years. During that time, she authored or co-authored over 50 technical reports, 20 journal articles, and 5 book chapters, and was co-editor of two books. She accompanies her husband on many of his field trips, and the two of them work together as consultants doing environmental surveys. Liz and her family spend idyllic summers at their remote island on the Minnesota-Ontario border where they live an old fashioned lifestyle with solar-powered electric lights, but no running water, cell phones, TVs, or computers. Liz has a wide variety of interests, including quilting, stained glass, watercolor painting, gardening, bridge, and volunteer work. She plays tennis and pickleball and continues to lead a very active life. 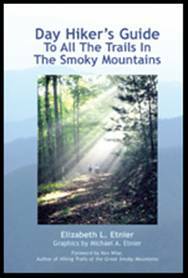 However, although they have lived within an hour of the Great Smoky Mountains National Park for over 40 years, Liz didn’t begin hiking until 1998, when she was 58 years old. She immediately fell in love with the mountains, and the exhilaration of hiking many miles in good company, surrounded by beauty at every step. 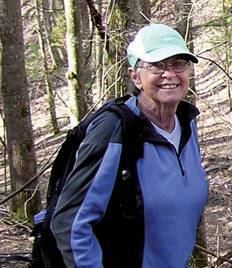 She soon became obsessed with hiking all of the trails in the mountains, and set a goal to complete that task before her 60th birthday. She found that planning the logistics of the hikes was often much more difficult than the hikes themselves, and Liz spent hours poring over the maps to find the easiest and shortest way to accomplish her goal. This book has resulted from those hours and hours of planning, and from the subsequent urging by her hiking friends to write it all down.